But rather than heed the call, the man said he went to another house. “My intention was to somehow move away from that location,” he said through a translator. Asked if he ordered anyone to do anything, he said he didn’t. “Is there anything you could’ve done to stop what was going to happen?” Begg asked. “No, I couldn’t,” he answered, adding that he did not agree with the decision to shoot the soldiers. Kevin Hatch, the representative for the Canada Border Services Agency seeking the man’s deportation, told the board that in an earlier interview, the man said that he had sent others around him to go — though there was a question of whether that statement had been accurately interpreted. Asked to clarify, the man testified Tuesday that he just mentioned to others around him that there had been a call for people with AK-47s to come forward. “I did not observe what the others did,” he added. Those who did not agree with ‘the decision to shoot the soldiers’ thought they could do nothing to stop this, but instead moved away. 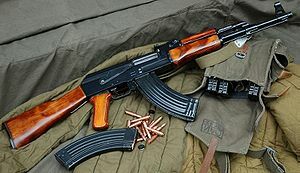 The instrument of choice was the AK-47, and even those who did not agree with the decision simply ‘mentioned to others…that there had been a call for people with AK-47s to come forward’. The first video shown in August 2009 was claimed to have been taken on a mobile phone and shows events that took place in January 2009. It was claimed that the pictures had not been edited, but Channel 4 did not make a copy of the video it had received available either to the Sri Lankan government nor to the UN Special Rapporteur on the subject. The Special Rapporteur was instead sent another copy of what was supposed to be the same video by a body called Journalists for Democracy, which was supposed to have supplied the original video to Channel 4. However the copy supplied to the Special Rapporteur was different from the original video, notably in having fewer extra frames (17 as opposed to 30 in the video broadcast on Channel 4) with a strange ‘uppercase letter “A” in white against a red background’. The Special Rapporteur did not reveal that he had not got the video requested from Channel 4. However one of the Experts he employed revealed this fact. They claim that the editing was done on a mobile phone, and insist that the entire sequence was filmed on a mobile phone. However they claim that there is an instance of optical zooming, whereas it is argued that mobile phones do not have optical zoom capacity. It seems clear then that the so-called Experts, as well as the Special Rapporteurs (who present themselves as the same person in essence, whether called Alston or Heyns), grant that there has been editing, which obviously leaves open the possibility of tampering. In this context it is worth recalling the photograph that has been published of the LTTE propaganda wing filming what was supposed to be an atrocity. He is of course quite correct, in that tampering with a film recording particular incidents does not mean those incidents did not occur. But if the narrative put forward with such a tampered film is to carry conviction, it would make sense to come clear about what has occurred. In particular, it must at the very least be suspicious that initially there were claims that nothing had been tampered with. When analysis revealed that there was something suspicious about the film, it was granted that there had been editing, but to maintain the story of trophy filming, which Little Jack Christof Heyns has pulled out like a plum, it has to be maintained too that the filming was done on a mobile phone, and all the editing too. To grant that something more sophisticated was involved would obviously give the game away. So the Experts and their paymasters (who insist that services were provided free, without saying anything about how expenses were covered, including the provision by one expert to another of a further modified version of the video) have to insist that even optical zooming was done with a mobile phone. But we know that the LTTE was in the habit of executing prisoners of war with AK-47s. We know that they would film scenes of destruction that were later to be used as propaganda. We know that some mistakes in the original Channel 4 film were modified by the time another version of it was sent to the UN Special Rapporteur. Anyone who understood induction would realize that it is not unlikely that the whole film is something doctored to make a terrorist case through the further sophisticated use of acknowledged terrorist activities.